Fort Loramie's Ben Barhorst swings during a nonconference game against Coldwater on Tuesday in Fort Loramie. Fort Loramie's CJ Billing pitches during a nonconference game against Coldwater on Tuesday in Fort Loramie. Fort Loramie's Eli Rosengarten gets the throw as Coldwater's Jake Wenning arrives at second during a nonconference game on Tuesday in Fort Loramie. Fort Loramie's Noah Guillozet attempts to tag out Coldwater's Will Broering during a nonconference game on Tuesday in Fort Loramie. Fort Loramie’s CJ Billing prepares to throw to first base after he fell to the ground stopping the bunt while Coldwater’s Zack McKibben runs to first during a nonconference game on Tuesday in Fort Loramie. Billing, who made the out, pitched a complete game and struck out seven batters while allowing three hits. Fort Loramie’s Shane Hilgefort reacts to a bad hop on a throw to second as Coldwater’s Noah Miller arrives during a nonconference game on Tuesday in Fort Loramie. 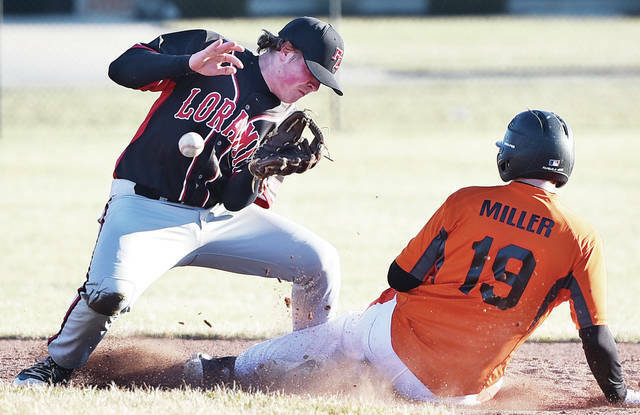 FORT LORAMIE — It’s been a typical cold Midwestern March week to start baseball season, but Fort Loramie’s bats have been as strong in its first two games as they were in state games last June. After opening the season with a shellacking of Fairlawn at home on Monday, the Redskins kept the hot start going on Tuesday with a 10-3 win over Coldwater in a big early-season nonconference game. The Cavaliers finished as Division III state runner-up last season while Fort Loramie won the Div. IV title. Fort Loramie, which beat Fairlawn 24-0 on Monday, tallied 12 hits against three Coldwater pitchers and also drew six walks. Fort Loramie returns most of its players from last season and Sanders was confident with the batting strength of the top two-thirds of his batting order. He’s hoping to see good production out of Shane Hilgefort, Ben Barhorst and Darren Hoying this season in the last three spots and was pleased with their performance the last two days. Hilgefort, a senior second baseman, had flown out three times on Tuesday but came up big in the sixth to help Fort Loramie close out the win. He hit a grounder that flew along the right-field line into the outfield to drive in two runs and increase the lead to 9-3. He later advanced to third on a single to left field by Barhorst and scored on a balk. Fort Loramie senior CJ Billing pitched a complete game. Billing, a right-hander, had seven strikeouts and allowed three hits. Two of the hits Billing allowed came in the first inning. Austin Reithman led off the game with a double along the left-field line and Jacob Wenning hit an RBI single to center field two batters later to put the Cavaliers up 1-0. “Once CJ settled in, that kept their offense at bay,” Sanders said. “We were able to cash in on our offensive opportunities, got the lead, and from there, the momentum was rolling and we kept hitting. The Redskins took control in the bottom half of the first. Cater Mescher led off with a double along the left-field line, then Nathan Raterman hit a single to center field. Mescher reached third on the hit and then scored after an errant throw. Devin Wehrman later added an RBI single to put Fort Loramie up 2-1 after the first, and Mescher hit an RBI triple to center field in the second to increase the lead to 3-1. Coldwater took advantage of two errors in the third inning to cut the gap to 3-2 but Fort Loramie added two runs in the bottom half. Billing walked to start the bottom of the third, then Jared Middendorf singled and Wehrman singled to left field to score Billing. Eli Rosengarten then hit an RBI single to left field to push the lead to three runs. Raterman led off the fourth with a double, stole third, then scored on a passed ball to increase the lead to 6-2. 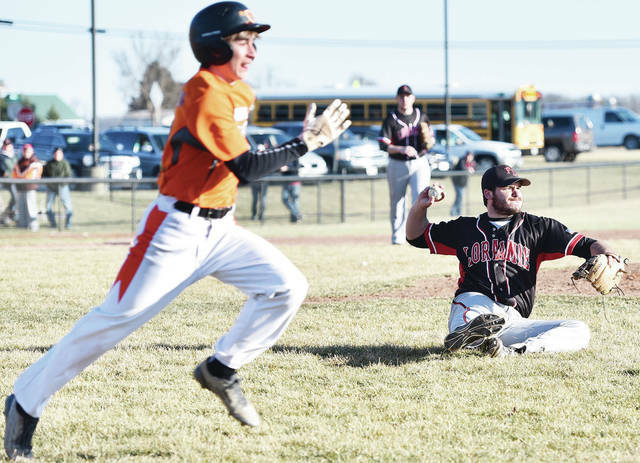 Coldwater scored one run in the fifth but Fort Loramie put the game away by scoring four runs on three hits and a walk in the bottom of the sixth. Mescher was 3 for 4 with 1 RBI, Wehrman was 2 for 3 with 3 RBIs and Raterman was 2 for 4 with 1 RBI. The Redskins will look to keep the hot home start going in a key early-season game against Russia on Thursday. The Redskins and Raiders tied for the SCAL title last season, along with Anna. Fort Loramie’s Ben Barhorst swings during a nonconference game against Coldwater on Tuesday in Fort Loramie. 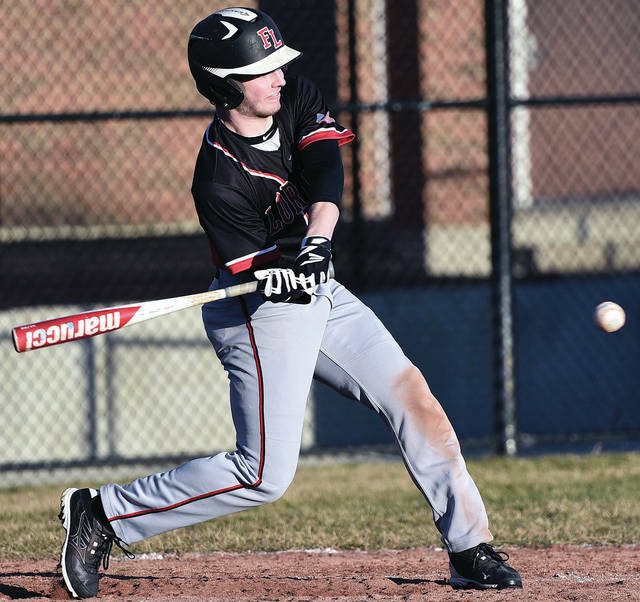 https://www.sidneydailynews.com/wp-content/uploads/sites/47/2019/03/web1_DSC_0157-3.jpgFort Loramie’s Ben Barhorst swings during a nonconference game against Coldwater on Tuesday in Fort Loramie. Fort Loramie’s CJ Billing pitches during a nonconference game against Coldwater on Tuesday in Fort Loramie. https://www.sidneydailynews.com/wp-content/uploads/sites/47/2019/03/web1_DSC_9540-3.jpgFort Loramie’s CJ Billing pitches during a nonconference game against Coldwater on Tuesday in Fort Loramie. Fort Loramie’s Eli Rosengarten gets the throw as Coldwater’s Jake Wenning arrives at second during a nonconference game on Tuesday in Fort Loramie. 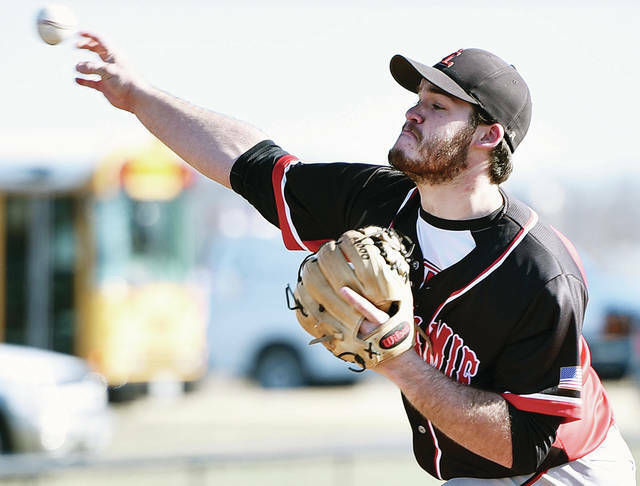 https://www.sidneydailynews.com/wp-content/uploads/sites/47/2019/03/web1_DSC_9788-3.jpgFort Loramie’s Eli Rosengarten gets the throw as Coldwater’s Jake Wenning arrives at second during a nonconference game on Tuesday in Fort Loramie. Fort Loramie’s Noah Guillozet attempts to tag out Coldwater’s Will Broering during a nonconference game on Tuesday in Fort Loramie. https://www.sidneydailynews.com/wp-content/uploads/sites/47/2019/03/web1_DSC_9966-3.jpgFort Loramie’s Noah Guillozet attempts to tag out Coldwater’s Will Broering during a nonconference game on Tuesday in Fort Loramie. This entry was tagged Baseball, Cavaliers, Coldwater, Fort Loramie, high school, Jeff Sanders, Redskins, SCAL, Shelby County Athletic League. Bookmark the permalink.